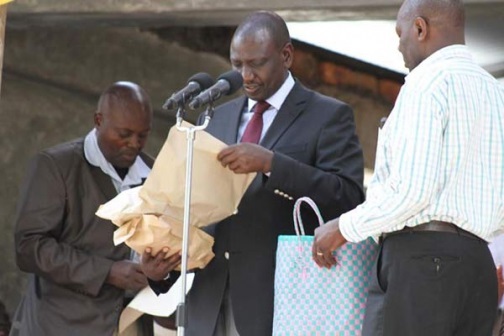 Tuesday March 25, 2019 - Religious leaders from Mombasa County have come out to defend Deputy President William Ruto’s generous contributions to the church urging him to continue with the mission. The DP’s penchant for church donations has been a subject of a heated debate with National Super Alliance (NASA) leader, Raila Odinga, questioning the source of millions he has been using to bankroll church activities across the country. The Coastal church leaders led by Bishop Paul Mwaura said his church would not reject donations offered by the DP because he has described himself as an evangelist dedicated to spreading the gospel and supporting churches through donations. “Those who are claiming the donations are from corruption proceeds are lost,” Mwaura said. Mwaura’s sentiments were echoed by Pentecostal Worship Ministries Jomvu chairman, Henry Muchiri, who maintained that he will not listen to what other people thought about Ruto's source of wealth but will instead focus on the value the support would have to the church. “Let us allow those who want to serve God do so without being victimised,” Muchiri said.